HP recently announced its intention to return to the market of mobile phones, and this will takes place next month with the launch of two new phablets. These are the Slate 6 and Slate 7 Voice Tab, which will debut in India next February. The company announced in a press release the specifications of the two devices, which practically only differ in size. Both carry Android 4.2 Jelly Bean and have a quad-core processor (although the manufacturer has not been specified). The internal memory is 16 GB and support microSD cards up to 32 GB. Both devices have an IPS screen, although the resolution varies slightly between models. The screen of the Slate 6 is 1280 x 720 pixels, while the Slate 7 will have a slightly higher number of pixels: 1280 x 800. Both devices have a rear 5 MP camera equipped with flash and a front 2 MP one. They also include front stereo speakers. Looking at the size, the two devices are considerably thin. The Slate 6 is less than 9 mm thick, while the Slate 7 measures 9.5 mm. 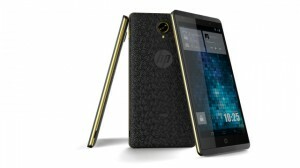 HP will release the phablets exclusively in China and currently there is no news about a possible launch in other countries. The company has a high percentage of the PC sales in that country, and this reputation probably will help it to enter to the mobile world market, where other brands are better established. Currently, Samsung, Nokia, Micromax and Karbonn (two Indian companies) have the biggest part of the market in that country, and Chinese companies like Lenovo and Huawei also offer phablets in its India’s product portfolio. HP had stopped selling smarpthones in 2011, and depending on the sales’ results of these devices, we may see it again in the European and American markets.